The Agile Rat - What Is Rat Agility? Rat Agility is much like dog or cat agility only the equipment is rat sized. Fancy or Pet Rats are very affectionate and intelligent animals. They are as far removed from their wild cousins as a wolf is from a dog. Rats can be taught tasks, tricks and behaviors. More and more people are keeping rats as pets so Rat Agility just makes sense. And, (smiling as I write) the equipment for rats is easier to transport and is easier to build and store then the equipment for dogs and cats. I have found, over and over, with many different ratties I have trained to do Rat Agility, that the animals love the equipment, the tasks and the fuss made over them for doing it as well as any treats they may receive....but mostly they love spending time and interacting with their trainer. The photo is of The Ballerina, a Hairless Dumbo doe. In this photo she is about 20 weeks old. It is highly recommended that you work with your rats at home before entering into rat agility competition. You can make many "make shift" agility equipment that won't cost much more then a couple of dollars and a bit of your time. See a few ideas on our Getting Started page here at this site. Your rat will not only do better in competition if you practice at home, but will be more comfortable in competition if it is familiar with the equipment and what is expected by you for the rat to do. So? What is Fancy Rat Agility? FUN!! FUN!! FUN!! Fun to teach to your fancy rat, fun to compete, fun for the rat, the trainer and any spectators. 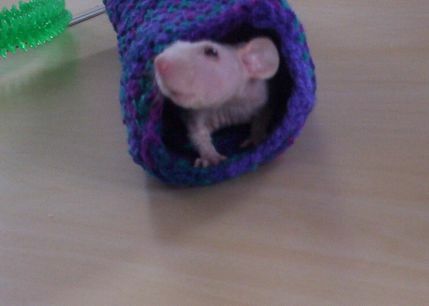 Grab your fancy rat and get started-you and your rat are gonna LOVE it.